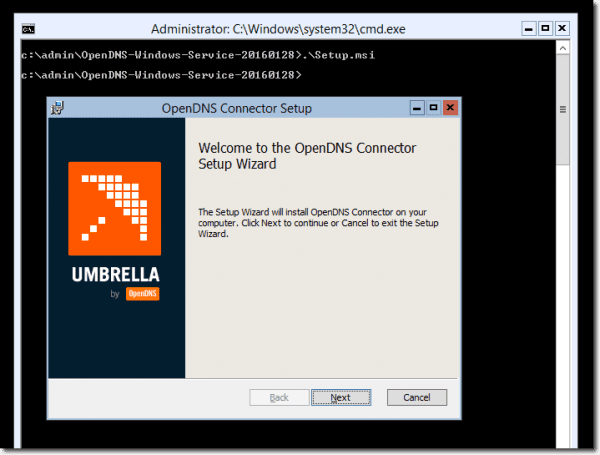 In my previous article, we set up redundant OpenDNS Umbrella virtual appliances to forward DNS data from our internal network to OpenDNS. We concluded with reports that correctly display IP addresses from our internal network. Now we want to go further and record Active Directory information such as computer login and group information. To do this, we’ll need to create an OpenDNS service user account on our domain, set up our domain controllers with the OpenDNS Connector service, and run a configuration script against all of our domain controllers. The connector will watch our domain controllers that the configuration script has modified and will relay the information to our OpenDNS Umbrella account. Download the files for the Windows Configuration and the Windows Service. When finished downloading, you’ll have three files: OpenDNS-WindowsConfigurationScript-20130627.wsf, Config.dat, and Setup.msi. 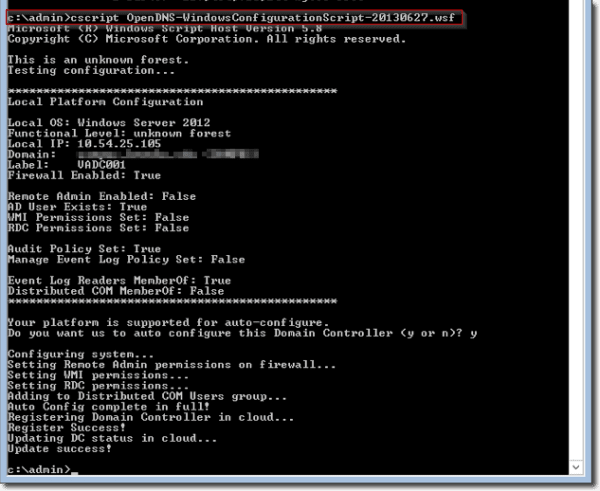 The Config.dat file will contain your OpenDNS account identity information. 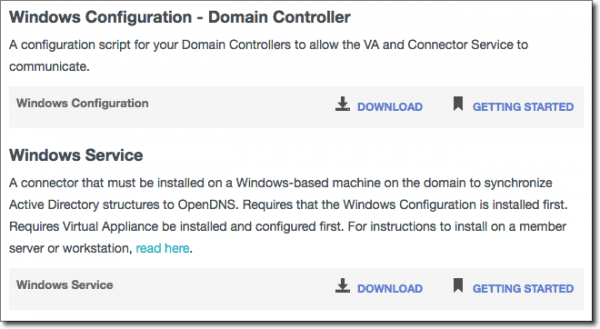 Install AD Domain Services Snap-Ins and the Command-Line Tools feature via Remote Server Administration Tools > Role Administration Tools > AD DS & AD LDS Tools > AD DS Tools. Again, you can either run the onnector service from a new stand-alone member server with AD Tools, or run it from an existing DC. I chose to do the latter and ran the service on my PDC. In addition to the connector and scripts, we need to create a new service user on our domain so our services run uninterrupted. 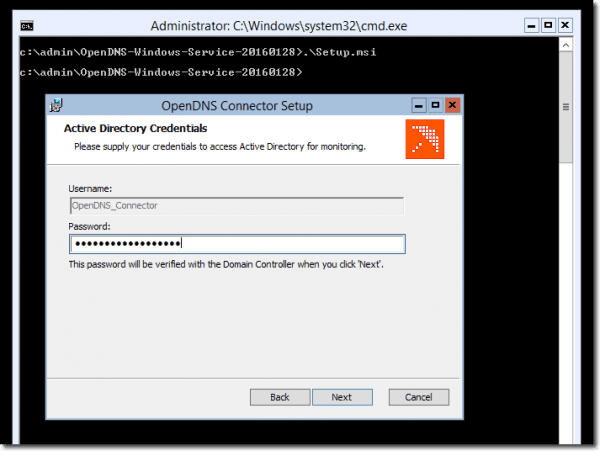 Create a new domain user account and set the logon name to OpenDNS_Connector. Next we want to run the .wsf script against all of our domain controllers. Open and run an elevated command prompt as Administrator. According to the instructions here (OpenDNS Umbrella account required), from the command prompt, enter c:\>cscript <filename> where <filename> is the name of the configuration script you downloaded. The script will display your current configuration, then offer to auto-configure the domain controller for operation y/n. Type y to continue. If the auto-configure steps are successful, the script will register the domain controller with the Umbrella Dashboard. Again, be sure to run the .wsf visual basic script on all of your domain controllers in each of your sites. In this instance, I only was required to run the .wsf script against one domain controller. If you have a domain controller that is a Core 2012 R2 server, simply copy the files to the c:\ drive, then run the Setup.msi file from the default command prompt with the command: c:\>.\Setup.msi. When prompted, provide the password for the OpenDNS Connector service account that we created earlier. After we’ve verified authentication, we can jump onto our OpenDNS dashboard and confirm that our AD Connector is listed, which we can see in the following screenshot. Once our AD Connector and AD Servers are reporting to our OpenDNS Umbrella account, we can now see our AD User and Group information listed in the reports under the Identity column. With just a little extra work, we can extend the amount of information available to us on our OpenDNS Umbrella Reporting console to include Active Directory information. If your organization has multiple sites, you can set up Connectors to monitor each location concurrently at no additional cost. It’s nice that OpenDNS Umbrella provides the support and tools necessary to secure and categorize DNS, provide accurate reporting, and manage DNS traffic from a single web-based console.